An Alaska fisherman, an off-duty police officer and a selfless Tennessee husband were among the victims shot to death by a Las Vegas gunman in the worst mass shooting in modern American history. “He saved my life,” Heather Melton told NBC affiliate WSMV-TV hours after her husband, Sonny, 29, was gunned down with dozens of others at an outdoor music festival. “He grabbed me and started running when I felt him get shot in the back. “I want everyone to know what a kind-hearted, loving man he was, but at this point, I can barely breathe,” she said. Sonny Melton, of Big Sandy, Tenn., was a registered nurse and worked at Henry County Medical Center. Melton graduated from Union University in 2015. The university tweeted condolences to the family. Cops sorting out the details of the shooting were also grieving for one of their own. Las Vegas Police Officer Charleston Hartfield, 34, was off-duty Sunday night and enjoying the country music concert when gunfire rang out. Hartfield had posted an image of the Route 91 Harvest Festival on his Facebook page Sunday evening, hours before gunman Stephen Paddock, 64, opened fire from his 32nd-floor perch at the Mandalay Bay Hotel and Casino. Friends said Hartfield, a father and military veteran, also coached youth football. Friend Troy Rhett said he sent Hartfield a text message late Sunday night, according to the Las Vegas Review-Journal. “I figured he was probably busy helping others,” Rhett said. “I don’t know a better man than Charles. They say it’s always the good ones we lose early. There’s no truer statement than that with Charles,” he added. Also killed was a commercial fisherman from Anchorage, Alaska, who was at the concert with a buddy. Adrian Murfitt, 35, was shot in the neck while he was near the stage at the Mandalay during a concert by country singer Jason Aldean, said Avonna Murfitt, Adrian’s mother. “Apparently, a fireman and a doctor both came over and did CPR on him, but he didn’t make it,” Avonna Murfitt told CNN. Lisa Romero, a secretary at Miyamura High School in Gallup, N.M., was also killed, as was Rachael Parker, a records technician with the Manhattan Beach Police Department in California. “She was close to a lot of people,” Capt. Tim Hageman told the Daily News. Hageman said Parker, 33, who had worked in the department for 10 years, was with two other civilian employees and a Manhattan Beach police officer who was shot in the arm. Also killed was special education teacher Sandy Casey, according to the Manhattan Beach Unified School District in Southern California. “She’s absolutely loved by students and colleagues alike and will be remembered for her sense of humor, her passion for her work, her devotion to her students, her commitment to continue her own learning and taking on whatever new projects came her way,” district superintendent Mike Matthews said in a statement obtained by Los Angeles station KABC. An online fund-raising campaign for Las Vegas shooting victims has raised more than $1 million. In just four hours, the GoFundMe page set up by the Clark County Board of County Commissioners in Nevada, which includes Las Vegas, was more than halfway to its goal of $2 million, said commission chairman Steve Sisolak. Sisolak, who said he started the fund with Clark County Sheriff Joseph Lombardo, pledged the first $10,000. Prayer vigils began across the city, including one led by Las Vegas Mayor Carolyn Goodman at City Hall. Among the victims of Paddock’s hate was Denise Burditus of Martinsburg, W.Va., who was attending the concert with her husband, Tony, her high school sweetheart. 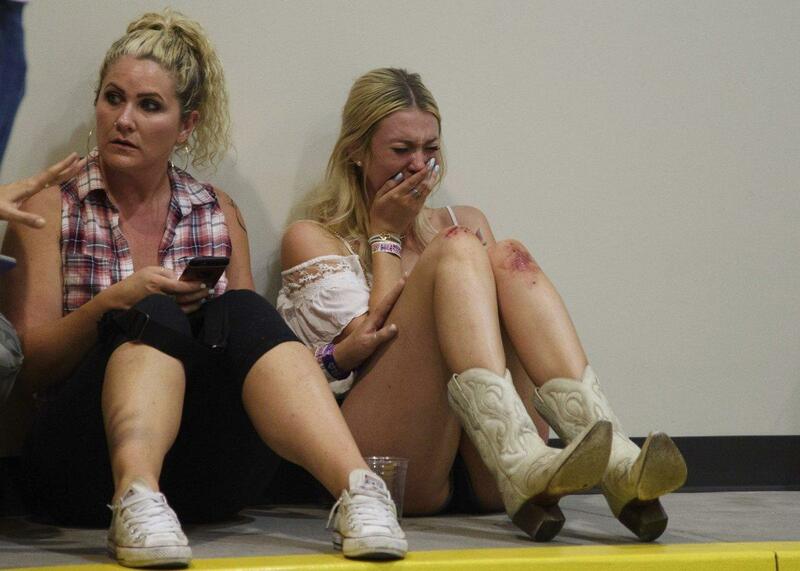 The victim had shared several photos of her and her husband enjoying the three-day music festival, including one taken just hours before the shooting. Tony Burditus shared a picture of his own, of him and his wife kissing.